A miniature projector small enough to fit into a mobile phone promises a full-size picture from a portable device - but may also lead to "visual pollution" and the need for legislation, an analyst has warned. 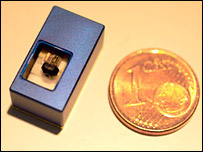 The projector, developed by the company 3M, is around 4cm by 3cm and designed to be embedded in PDAs, media players and cameras as well as mobile phones. Martin Raymond, founder and director of the Future Laboratory, told BBC World Service's Digital Planet programme that in theory, they will allow content to be displayed virtually anywhere - such as onto the back seat of a bus, or on a train, or a wall. But he warned that, while the idea is "appealing initially," he had concerns about "intruding into personal spaces, visual pollution, and inappropriate showing of things that maybe other people shouldn't be seeing." "So actually, in the guise of something that seems quite sensible, we're going to see a lot more laws and legislation to prevent us from airing our films in public," he added. Mini projectors are becoming an area of intense technological development. A mobile phone which has the internal functionality of a laptop - and has data inputted by typing on a keyboard projected onto the table - was showcased at the Consumer Electronics Show. 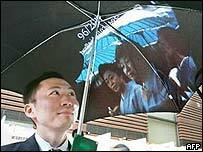 Meanwhile umbrellas which project photographs, television shows and maps - to help guide the user around in heavy rain - are being trialled in Japan. The 3M mini projector is also designed to tackle the problem of incompatible projectors when people deliver presentations. Many people who attend meetings or conferences will be familiar with the difficulties of trying to get the images on their personal laptop to show through the venue-supplied projector. Mr Raymond said that digital projectors as they exist now have never had the robustness of old carousel-based slide projectors, and that the frustration and lack of trust that has developed is something that could be addressed by the mini-projector system. "We tend to trust tactile technology, and if you think about the old slide system, you could physically see the slide moving around the carousel," he said. "What you have now is a problem of virtual or intangible presentations or projections, which really make it difficult under times of stress to make you comfortable with what you are projecting."